In other words, the one almost no-one uses. I believe I was attempting to add a vaguely historical flourish to a comment I was making. Unfortunately the person I was speaking to was German, and wont turned out to be a word they hadn’t yet added to their English vocabulary (can’t blame them really). So I found myself explaining the word ‘wont’. I knew its general meaning, but I couldn’t really communicate why it felt old-fashioned, and I certainly didn’t know its origins. It was just an “old word”. I come across old words a lot, because, let’s face it, epic fantasy novels are riddled with them. Why Does it Sound Old? We generally recognise an old-fashioned word or turn of phrase when we encounter it. Some part of our brain registers that this is a word we usually only see in old books, period films, and certain types of fiction. These words can be fascinating: little relics that live on in our language today, throw-backs to old ways of speaking. However, we rarely have much idea of why a particular sentence or word sounds old. Sometimes the archaic feel in fantasy is achieved simply by using old, out-of-fashion words, words like wont, bade, fain, anon, smite, slain, hearken, fell, unto, thrice, prithee, forsworn. In Australia, we’ve even got one in our national anthem: “our home is girt by sea”… which just feels odd when you have to sing it. 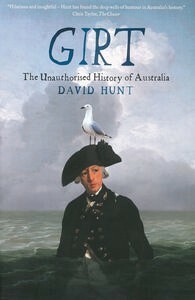 This has recently been used, rather cleverly, as a title for a book on Australian history: Girt: The Unauthorised History of Australia. It’s fascinating to explore the origins of some of these old words. For example, prithee is apparently a 16th century alteration of “pray thee”, and forsworn comes from the Old English forswerian meaning “swear falsely” or “abandon or renounce an oath.” If you want to find things like this out, it’s as simple as typing your ‘ye olde’ word into the Online Etymology Dictionary. Speaking of which, “olde” is a “pseudo-archaic mock-antique variant of old” and was first used in the early 1900s. So the whole ‘ye olde’ thing… it’s not actually very old. It’s mock-old. And if you’d like a list of some archaic English words, Oxford Dictionaries has created one. Using “are” would be the modern thing to do… but ‘be’ just sounds so much more, well, old and weighty, doesn’t it? So why doesn’t it just sound like bad English? This is actually the use of a now largely obsolete form of the subjunctive mood. If you’ve ever learnt French, this won’t be such a foreign concept. The French language still makes regular use of the subjunctive. This mood is usually used to indicate uncertainty. So where “He is” (present indicative) suggests a known and objective fact, “He be” and “He were” (present and past subjunctive) suggest an uncertain or hypothetical state. 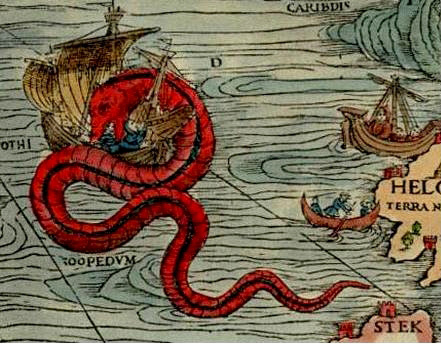 So what about the famous phrase on maps “Here be dragons”? Is that subjunctive like the phrases above? Does it suggest there may or may not, in fact, be dragons there? Well, opinions seem to vary on this one, but from what I gather, it isn’t subjunctive. This is apparently just an archaic form of the present tense. In other words, this is just an Early Modern English way of saying “are”, one we still retain in phrases like “the powers that be”. It’s also worth noting that the only two known historical uses of the phrase “here be dragons” were in Latin: HC SVNT DRACONES (i.e. hic sunt dracones: here are dragons). So “here be dragons” is simply an archaic English equivalent. You might also have noticed that all this use of “be” is a little reminiscent of pirate speak, e.g. “Aye, ye be a scurvy dog”. Interestingly, our idea of how pirates speak has little to do with how historical pirates actually spoke, and much more to do with Robert Newton’s portrayal of Long John Silver in Disney’s Treasure Island (1950). The actor used his local accent (from south-west England) and the impression stuck. (For more on this, and on the many other things we get wrong about pirates: Aye Before E, Except After Sea). Regional English dialects often retain some of the archaic pronouns and conjugation no longer used in mainstream English (See: Grammar in Early Modern English). So the ‘ye be’ of the pirate is indeed an example of an archaic form, but it seems to have only become associated with pirates due to its retention in regional dialect. 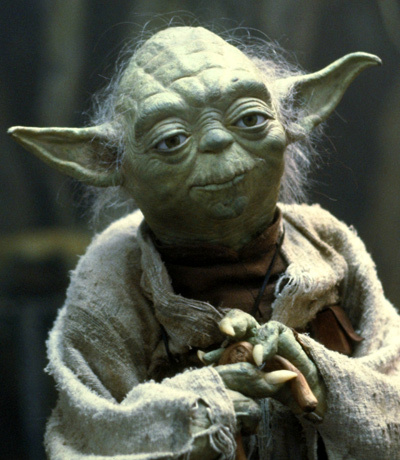 When Yoda speaks, he regularly places the subject and verb at the end of the sentence. However, this disruption of the subject-verb-object word order we’re used to in present-day English is not a Star Wars invention. “Good” and “dear” were often added before a title to politely address a stranger e.g. 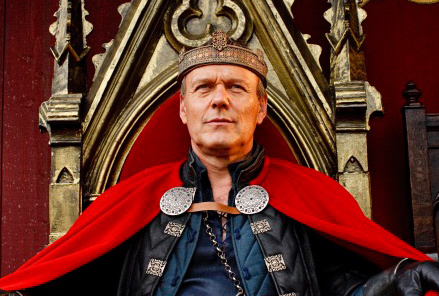 “good sir” (Elric) and kinship terms such as “father, sister, brother” were used as terms of intimate address. In modern English we would rarely use such ultra-polite, deferential language, but in fantasy novels these more archaic polite forms work well to suggest a society more reminiscent of a feudal England, with servants and nobility. As these archaisms sucked me into a vortex of researching, I realised there were more than I could tackle in one post, and many were too fascinating to ignore. So come back next Monday for some hithering and thithering, thouing and theeing, and maybe even some bethwacking. Ah yes I forgot about “hear ye, hear ye”! I was reading up about ‘ye’ the other day actually. Apparently it was the plural form for centuries, then also started getting used as a polite singular form (and morphed into you), and then eventually completely replaced the singular ‘thou’. I often think it’s a shame we no longer have a unique second person plural form, and have to make do with things like “you all”. There be archaic words explained here! Great post, can’t wait to read more next week.